Very exciting. We’ll be sure to see some great baseball seasons for years to come. It may have been overcast and drizzling this afternoon in Morgantown, but that couldn’t keep the smile off the face of West Virginia University baseball coach Randy Mazey and all of those who enjoy baseball throughout the region. 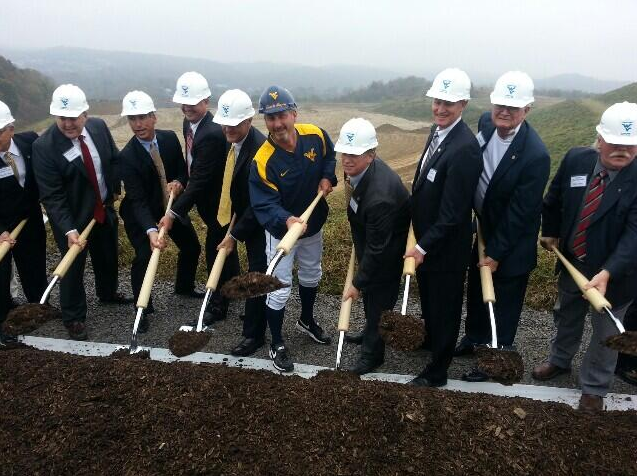 That’s because ground has been broken on a new ballpark at the University Town Centre. The official groundbreaking ceremony, organized by CONSOL Energy, Inc., brought together a very large contingent of state and local dignitaries. Among those making brief remarks included local developers John Lynch and Jason Donahue, West Virginia University president Jim Clements and director of athletics Oliver Luck, West Virginia Speaker of the House Tim Miley, Senate President Jeff Kessler, state Senators Roman Prezioso and Bob Beach and Gov. Earl Ray Tomblin’s Deputy Chief of Staff, Jason Pizatella. Javon Franklin is on campus! Gold Blue Debut: Let’s bring on the Mountaineers!